The ultimate product for a truly beautiful DARK, DARK tan. Xen-Tan have pioneered the use of precious Argan Oil in this formulation - the concentrated liquid-lotion is even easier to apply and provides a silky moisturising feel. If you thought our Dark Lotion range was dark, you’ll be seriously surprised with Moroccan Tan. 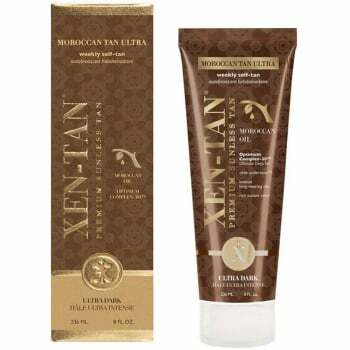 An innovative liquid lotion with premium Argan Oil combined with Xen-Tan’s trusted tanning formulation. This silky and lightweight weekly self-tan, glides easily onto the skin giving an instant natural colour, thanks to its deep guide colour. Instantly moisturising, your tan will gradually develop into a gorgeous deep olive colour whilst leaving your skin feeling smooth and supple. Scented with tropical coconut it applies evenly and dries instantly, giving a flawless colour time after time – whatever your skin tone.